A couple of nights ago, while walking into my kitchen I saw this beautiful moon outside my back window. It was dusk, slightly hazy and the moon hung just above this leafless tree. I had to get the moon shot. What you don’t see in this shot are the rooftops of my neighbors homes, for which I’m glad. I was able to frame the shot without including them. took some rough readings and shot about 15 frames with very slight variations. The winner turned out to be the shot above, shot at f8 at 160, ISO 400. I converted the image to B/W so to add to the drama of the moon and a seemingly dead tree. I also did a couple of different crops to vary the feeling a bit. 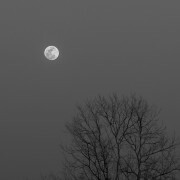 My only regret, yes I have those as well, is that the moon was bit too close to the tree. It would have been, IMO, a slightly stronger photo is the moon took up a bit more of the negative space to the left. I could have easily moved the moon using Photoshop but I had two issues with that. First, it wouldn’t be integrous. I know, I probably could have argued ‘artistic license’ but NO! Secondly, upon looking at the image longer I began to appreciate the emptiness to the left. It says something of the night. There is one other version that I did publish, and that was a square (1×1) version for Instagram. I do like the square version but, it also reinforced that, again, I really like the negative space.